The following story from The Hollywood Reporter, contains spoilers about the premiere. If you haven't watched episode 7.01, ignore this post! "Are You …?" "Yes." 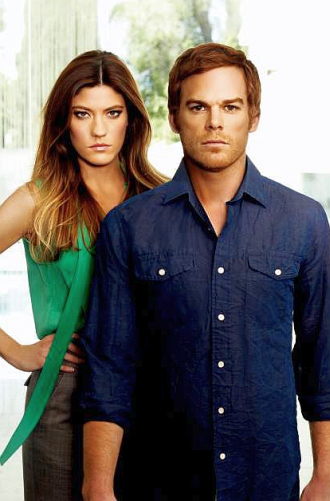 After muttering those words, Dexter's Debra Morgan (Jennifer Carpenter) learned the full truth about her foster brother: that Dexter Morgan (Michael C. Hall) comes with a Dark Passenger who, yes, is a serial killer. The seventh season premiere of Showtime's Dexter, continuing where the shocking finale ended, completely changed the face of the series now that Deb is fully aware of Dexter's true nature -- a serial killer. "It doesn't fully resonate with him what a burden [knowing about Dexter's Dark Passenger] is for her," he says of Deb's reaction. "You see him defending himself in a way that he has had to do and he never apologizes for what he's done or what he can reasonably expect will continue to do. He has a sense of righteousness about who he is and how he's managed it and what he does." While Dexter went outside Harry's suggestion that he never tell Deb about his Dark Passenger, how she'll respond to news of who he really is isn't his only problem. Louis, Masuka's (C.S. Lee) ace intern, is a little more than obsessed with Dexter. After rejecting his homicide-themed video game, Louis had the Ice Truck Killer's hand and sent it to Dexter last season. Matters get worse when Dexter is ticked off when Louis uses his laptop when visiting Jamie, prompting him to cancel his credit card. "Dexter underestimated just how much of a blow it was when he rejected Louis' game. He will come to appreciate that he's created a bit of a monster by rejecting him so forcefully," Hall says. "That's going to be bit of a monkey wrench for a time for him." Beyond that, LaGuerta (Lauren Velez) discovered the Dexter's blood slide from Travis' murder at the church and reclaims it after Masuka tells her that the only person from Miami Metro to use blood slides for crime scenes was her old friend Sgt. James Doakes, aka whom everyone thinks was the Bay Harbor Butcher. "She was close with Doakes and recognizes what that blood slide could mean and is not going to just let it go," Hall says. I" think we can imagine where that might lead in terms of the possibility of her reopening that investigation. She is one of the many potential, if not very real, threats at this point.So who's Dexter's biggest threat? Deb, with her knowledge of who he is and her ability to arrest him at any time? LaGuerta, who could reopen the Bay Harbor Butcher case? Louis, who already is bearing an uncanny similarity to Dexter's Dark Passenger? THR quizzed Hall, Carpenter and Dexter showrunner Scott Buck to find out. "It's between Deb and LaGuerta: Deb because of what she does know and LaGuerta because of what she doesn't and wants to know," Hall says. "Ultimately, I think Dexter could hold out some hope that he could enlist Deb in a way that he could never enlist LaGuerta because they're not family." "Deb, without a doubt," she says. "There are moments where we're having scenes and I've got my hand on my badge and you don't know if that's it, if it's 'That's enough of this game,' or 'I can't hear it anymore.' Deb's hand is always resting over the trigger. "For his part, Buck says Dexter's biggest threat isn't either Deb, Louis or LaGuerta. "It's himself. Dexter is his biggest, scariest enemy throughout the season," he says. "That's part of the fun of the season: When you think he's stomped out one thing and then another threat comes from another direction. It's him constantly juggling all these huge threats throughout the season and one episode may be bigger and just when he thinks he's dealt with another, it suddenly resurrects itself in a much more powerful way." Then again, there's always Ray Stevenson's new big bad to potentially contend with.